The Computation and Communication Structures Group explores hardware and software structures for systems that process and transport information. In this domain, high performance parallel computing, software-defined radio and cyber-physical systems concepts are intermixed. We call this the cyber-physical network. Our central effort, CROSSMobile, is a radio-access-network-agnostic system in which computing is pervasive — even beyond the wireless network’s edge — a concept we call edgeless computing. 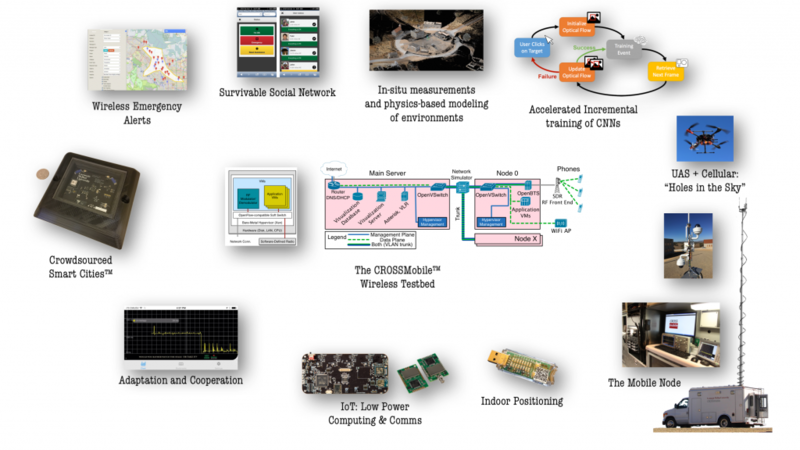 CROSSMobile has led to our exploration of wirelessly-connected low-power devices in smart city applications including the development of tools for power optimization of programs on these energy-impoverished devices. We have explored principles by which crowdsourcing can hasten the emergence of smart cities and techniques by which crowdsourcing can be used for earthquake early warning. We are also examining techniques for programming huge, distributed ensembles of time-aware systems across which timing precision can only be weakly maintained. We’ve studied wireless networks and the roles they play in emergencies. Our re-examination of the Wireless Emergency Alert (WEA) system influenced FCC rulemaking. Our Survivable Social Network concept explores how limited-bandwidth networks can serve large populations when all else fails. We study unmanned aerial systems (UAS — “drones”) as both network clients and network elements. Our analysis of cellular propagation for drones led to an understanding of the so-called holes-in-the-sky problem and possible techniques for using neural networks to combat it. This in turn led to an exploration of how drones can be rapidly and efficiently trained, in flight, to assist emergency first responders and others in rapidly-unfolding situations where visual analysis is essential. Most of this research is carried out both in the lab and in the field. We maintain a flexible and powerful mobile RF laboratory that serves as a CROSSMobile node and ground support for UAS missions.